Tailor-made bathroom door designs for your home. A question often asked by consumers, are uPVC bathroom doors a good choice for bathrooms? Well, the answer is yes. uPVC bathroom doors are the aptest choice for stylish bathrooms. Bathrooms today are not just for the regular usage but have an all-encompassing purpose as well. A well-designed bathroom adds to the beauty of the house and the bathroom door design is an integral part of it. A very convenient choice for bathroom door designs. This door is ideal for smaller bathrooms, as this bathroom door design eliminates the task of deciding which side the door would open. It would also save space in a bathroom while giving the bathroom a very sleek and customized look. In the case of uPVC sliding doors, the bathroom glass door will add an aura of class to your living space’s bathroom. A tailor-made choice for larger bathrooms, uPVC casement doors has openable bathroom doors, which can be offered with a combination of fixed and openable design. It can be customized to have a flying mullion. This bathroom door design is very suitable if one wants their bathroom to be airy and it will help one use their space smartly. Both types of bathroom door designs are very much in demand for giving the bathroom spaces the beautiful and alluring look. With the use of uPVC bathroom doors, there is no issue of rotting because of moisture. Had it been wood, then it would have rotted and would have created a very unpleasant smell in the washroom along with sanitation issues. However, with uPVC bathroom doors, there is no issue of flaking, rusting, repainting or fading. They are highly water resistant as well. uPVC bathroom doors are very easy to maintain. An occasional swipe with a cloth can keep the doors extremely clean and durable for many years. These bathroom door designs have undoubtedly won many hearts with their aesthetic quality. All of these bathroom door designs are found in highly customizable patterns and are available in interior themes. 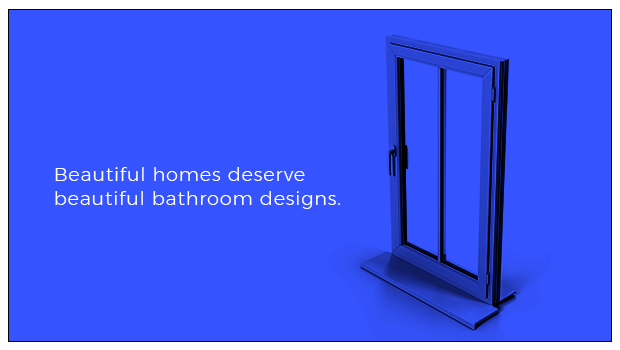 With so many points in favor of uPVC bathroom doors, Aparna Venster is the best choice. Find ease in designing your home with varied customization options in uPVC door.